Continuing & Career Education at Assumption College offers superior academic and professional programs for adult students. Our professional programs are designed to meet the constantly evolving needs of professionals and the organizations they work for. New technologies, new markets, and new work climates require up-to-date training and education. Students are educated to meet challenges, advance careers, and achieve goals, both for themselves and their employers. In a survey by an outside agency, 100 percent of our students who responded to our survey, reported they would choose Assumption again, if given the choice. Assumption College is known for its classic liberal arts curriculum, as well as strong business and professional studies programs. Our online courses offer the same course content, the same qualified instructors, and the same grading criteria as our traditional courses. The only difference is the method of delivery. Online courses offer adult learners the flexibility to choose the best time and place to learn. Sometimes family and career obligations prevent students from attending class at specified times, on campus. Online courses provide the opportunity to earn college credits by participating in discussions and completing assignments at times convenient for you. All programs are taught by professionals with real-life experience and expert faculty attuned to the unique realities of adult learners. Instructors are specially trained in online course delivery. You will interact with your instructor and classmates through threaded discussions and chat online, and you will submit assignments and participate in group projects via Blackboard™, our instructional management system. Our tuition is as much as 85 percent LESS than competing non-credit programs offered by other colleges and local professional schools. We put our students needs first. We offer online courses to make learning more convenient for adult students, as well as free tutoring and free academic counseling. In just ten weeks, Assumption's Online Pharmacy Technician Certification Training program will prepare you for entry-level pharmacy technician positions by teaching you medical and pharmaceutical terminology, basic anatomy related to the pharmacology of medications, and pharmaceutical calculations. You will gain hands-on practice in retail pharmacy procedures through an online lab module. You will learn what information is necessary to process prescriptions and physician orders. The curriculum also includes the ethics of pharmacy practice and education about prescription medications, patient care and interaction, and charges and reimbursement. The program is distinguished by a long list of special features that benefit adult students, including: career planning for life, the most generous transfer credit policy in the area, values-based core curriculum, superior instruction in a nurturing environment, and a safe, renowned community of learning that supports you for the rest of your life. 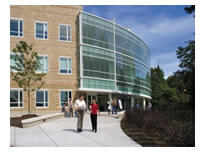 Assumption College is accredited by the New England Association of Schools and Colleges (209 Burlington Road, Bedford, MA 01730; 781-271-0022; www.neasc.org). Format is online using state-of the-art delivery. Blackboard platform. Loans may be available to credit bearing classes. Applicants may apply by completing the Federal Application for Free Financial Aid (FAFSA). My experience at Assumption was wonderful. It taught me how to learn, with small classes and professors who was compelled us to think deeper and in new ways.